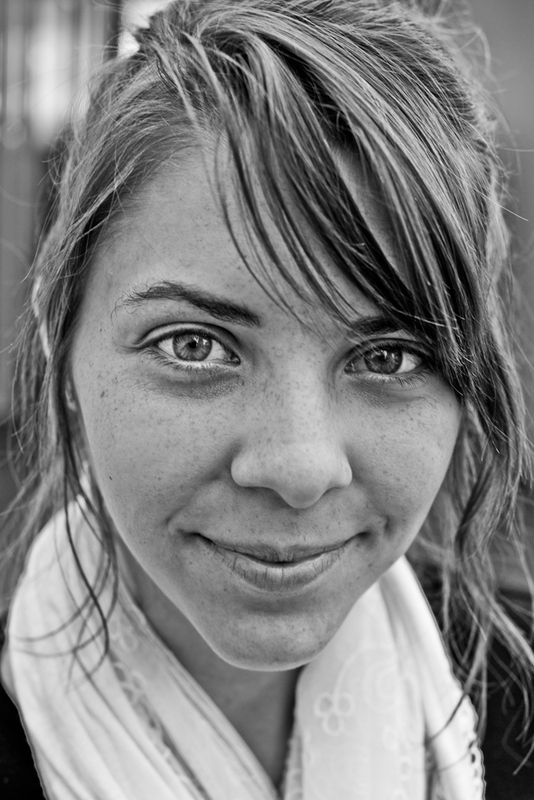 Although I photograph a variety of subjects, the human face fascinates me most. I usually shoot black and white for portraiture, and to reveal that certain inner essence that represents how I see the individual requires the model’s trust. We must reach a point in our session where we are just two people in conversation and the camera recedes from attention. If you ask someone to look determined, or fierce, or elated, it will not work, in my experience. The photographer must elicit actual determination, ferocity, or elation. An actor who can completely and convincingly portray true emotion on cue scarcely exists outside of stage and screen, and in our media-saturated world, I think people find it difficult to react in a pure and genuine manner with a camera around—frequently we mimic what we have seen as the “correct” response that fits the zeitgeist and meets the perceived approval of our peers, or the photographer. I don’t want to capture a pose, but rather a personality. Amanda Belles’ team recently won a competition at the “Hack Arizona” convention for a robot they built in just 36 hours. The robot teaches itself how to walk in varied terrain. Amanda wrote the software—the robot’s brain, in effect— with techniques from genetic programming, one aspect of her astounding intelligence revealed. And yet she is the most approachable, down-to-earth individual imaginable, quick to joke and laugh, and as agreeable a model as one could want for a portrait session. ut the problem is exactly this. Amanda’s bright, wide smile, and her openness actually mask the fiercely curious, competitive, and incisive intelligence that compels this image. I had only ten minutes to get this particular shot, so I tried to make her laugh to reduce any nervousness—who can relax when a giant black camera with a massive piece of glass is thrust into one’s face? We changed locations for softer light, and I sensed that like a lot of people do when forced to pose for the camera, she began to lose interest. So I asked her something rather dumb. It worked. She took just a moment to form her answer—too polite to call me an idiot—and I got the shot I wanted. In it, you see what sharp focus she possesses, and the hint of her smile reveals her amusement at someone—me—not quite so bright as she is. The intensity of her eyes mirrors her absolute clarity and confidence. Amanda shows this expression rarely, almost as if she wants to conceal her genius or that it embarrasses her, but irrepressibly, it breaks through. Of course, people I photograph do not always love my pictures of them, which I understand. I don’t airbrush freckles, cowlicks, and the like out of a photo. I do not make idealized images of the physical form of the person, but instead seek what lies at the core. I find this far more beautiful than highly stylized, tone-perfect glorification that cannot exist without an army of stylists, art directors, and post-processors. I greatly admire such photography, but I search for something else. Some call it the “Leica look,” and photographers I revere, like Sebastião Salgado and Steve McCurry, heavily influence how I try to see. In this session we used a Canon 5D Mk III and a 50mm 1.2L lens set to f/5.6. Typically portraits call for moderate telephoto lenses in the 70mm to 135mm range, but I use this particular 50mm for close portraits because I can remain at normal conversational distance as I shoot and it gathers enough light to control the depth of field to a ridiculous sliver, if necessary. In the early 1970s I learned film photography, how to process and print in the darkroom. After a long hiatus from photography, I decided to tackle the new digital technology, but that ancient film experience comes in very handy. I still love street and portrait photography in black and white, but thoroughly enjoy the variety that digital allows without breaking the bank. I now take classes at Northern Arizona University as an irregular postgraduate to fill in the great gaps in my knowledge and to expand my artistic horizons. After all, in the end only the image matters.